Demens is fine here, I think. Mesh is tough on LBs in zone. Here he lets the receiver outside of him but he has to expect Avery will be there. He also knocks down the other guy running a drag, which is a bonus. While I agree that Demens wasn't the main culprit on the touchdown, he was largely responsible for the blown coverage that led to the touchdown. 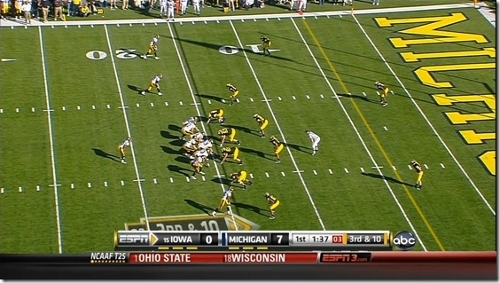 Michigan is in a 4-2-5 look playing cover-3. They rush four and drop the linebackers and the two corners into underneath zone coverage. 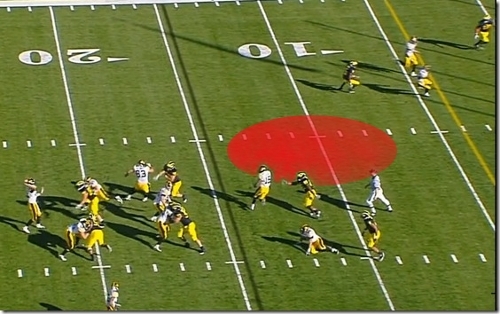 Iowa is in a three-wide set with a tight end on the strong side of the field and one tailback. 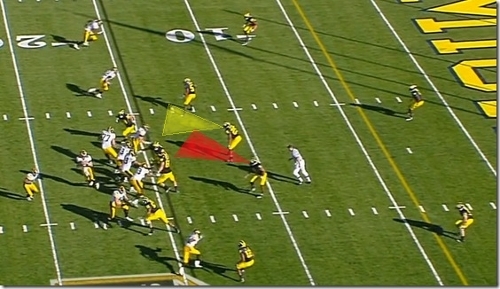 Iowa sends two vertical routes at Rogers on the strong side of the field, while the weakside receiver and tight end run crossing routes below the linebackers. Right as the ball is snapped, you can see a problem with Demens' position in relation to the play. While Jonas Mouton is scanning the field and looking into the backfield, Demens has his back mostly turned to the weakside of the field. It's because of this positioning that Demens fails to see the crossing receiver until it's too late. Demens comes up to re-route the tight end, which I don't think is his job. The tight end is very clearly dragging across the field and Demens has Mouton next to him to carry the tight end in the zone. Demens still hasn't seen the crossing receiver. This is where you can see the difference in how Mouton and Demens defended this play. Mouton is on the balls of his toes, taking a step back as the tight end crosses into his zone. Demens, meanwhile is pushing the tight end to the ground. This is the first time that he sees the crossing wide receiver. Courtney Avery is still in good position right now and has effectively re-routed the slot receiver. This is the "uh-oh" moment for all relevant parties. Avery who was in position in the last screen has decided that, rather than turn back to the quarterback, he'll keep his eyes on the slot receiver. Demens, meanwhile, is a statue as the weakside receiver runs right by him. A fairly conservative estimation for Demens' zone is the red spot on the field--it may even be further to the boundary as he was the strongside linebacker. As you can see, he's nowhere near it, and worse still, he's standing motionless. Avery is actually still in his zone, albeit fairly deep. The bigger problem with Avery is that he didn't turn around. Demens actually hasn't moved horizontally since the play started, and with Avery looking the wrong way, there's essentially an entire half of the field that's open. Stanzi sees this and makes an easy pass to a completely unguarded receiver. This is how the play ends: The weakside receiver, still in the middle of Demens' zone, catches the ball completely unabated. 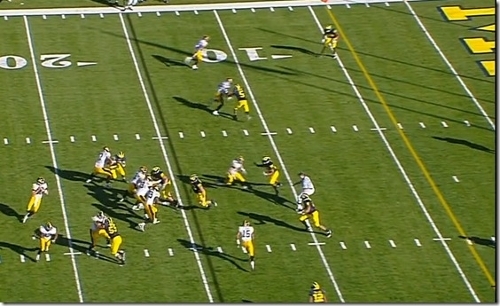 Avery, meanwhile, has just not gotten his eyes back to the play and eventually slips trying to get back upfield. Avery wasn't in great position here, but he also wasn't in terrible position. If he hadn't fallen, he might've had a chance to make the play. Demens, on the other hand, has completely blown his assignment that would, even if Avery had played this perfectly, netted at least five or six yards. What's especially disappointing is that, as you can see in the final screen, Craig Roh had gotten to Stanzi on the pass rush. Had Demens even feigned coverage here, it would've made Stanzi hold onto the ball longer and either make a poor throw or eat the sack. I'm going to go back and watch the game to see how well Demens did overall. I'm fairly certain he did better than Ezeh (something that the Michigan blogosphere is mostly in agreement about), but I think MGoBlog's UFR probably overlooked a few plays like this out of sheer excitement and hope. You should ask yourself why Mouton didn't knock the WR off his crossing route once the WR entered Mouton's zone, in a similar fashion that Demens did to the TE. Then you should ask yourself in what zone defense is a CB responsible for covering the flat supposed to ever turn his back to the play, let alone drop back 20 yards from the line of scrimmage when he has defenders in a zone behind him. Then once you have done that, reassess the play. My knee jerk reaction to the play in real time was that it was Demens' fault. 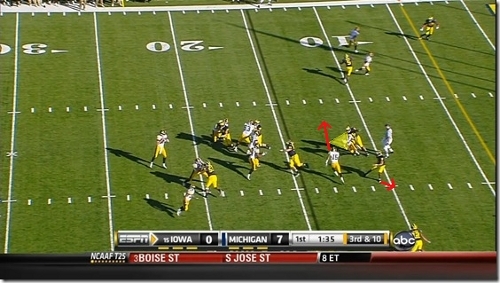 I was a little surprised at MGoBlog's analysis of the play, but I didn't entirely disagree with it either. Hearing both sides, I think it's safe to say that both Avery and Demens erred. I agree with the previous comment that covering the flat as a corner, then turning your back to the quarterback is almost always the wrong way to play that. Re: Avery. Avery is not assigned to the flat here. He's assigned to an underneath zone: Avery, the two linebackers, and the weakside corner (Floyd) have quarters coverage between the line of scrimmage and the first down marker--for the record, Avery gets no deeper than 10 yards from the LoS, not the 20 you suggested. 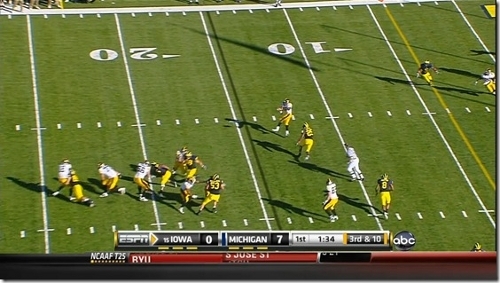 The deep safeties split the field into thirds beyond the sticks, and Michigan brings a four-man rush. Avery never really "vacates" his zone so much as his head is turned the wrong way, forcing a much-too-slow reaction to the play. In terms of the Demens vs. Mouton question: You don't cover receivers by knocking them down. If you did that, offenses would just start throwing at the collisions and get constant pass interference calls. The point of this coverage was to force a dump off (check) and get a tackle before the sticks (whoops). Part of the reason this play was successful for Iowa is because Avery was trying to do too much and took himself out of position. The other reason was that Demens didn't defend his zone at all. Avery doesn't get off without being criticized here, but he also shouldn't be chastised because another player missed an assignment. Two young players making minor mistakes resulted in a big play for the opposition: This is the life of a young defense.